Dreaming of Spring...You Can Grow That. While most of America scours sale flyers and races to malls in search of perfect holiday gifts, we gardeners anxiously await bargains of a different kind. The end of season bulb sales. It starts slowly with our favorite mail order nurseries. E-mails entice us, offering 20 percent off...30 percent...40 percent...sold! And because some overzealous gardener ordered thousands of sale bulbs last year...and then spent weeks planting them in the midst of the holiday season, restraint is in order. Just a few. ...maybe a box of tulips to plant as a cutting garden. Oh, and a few species lilies to try, plus of course a few extra Casa Blancas. After all, Casa Blancas featured in my long ago wedding bouquet. A girl can never have too many Casa Blancas. Oh, wait. Let's not forget the important bulbs. Paperwhites to force for teacher gifts, and a few new amaryllis bulbs to sample...but only a few, because they're not on sale. Not bad. In fact, when the shipment arrives, it's only one, medium-sized box. I congratulate myself on my restraint. ...where there are bulbs. Boxes and boxes of bulbs. I know what you're thinking. You're right. Still, I challenge any gardener to pass up 75% discounted bluebells and tulips. I promise you, my friends, these are not disease infested, moldy, shriveled up bulbs. They're plump, lush, and filled with potential. Yes, they're a little smaller than my mail order beauties, but they'll do just fine. Most of my purchases will find homes in the perennial beds, but a few varieties that are more shade tolerant and deer resistant will be incorporated into the forest paths. Plus, a few will remain indoors for a bit of color during the gloomy winter days. Bulbs are brilliantly easy: dig a hole the depth according to the directions on the package. A good rule of thumb is to dig a hole to a depth of approximately three times the height of the bulb. Then plant the bulb pointy side up. 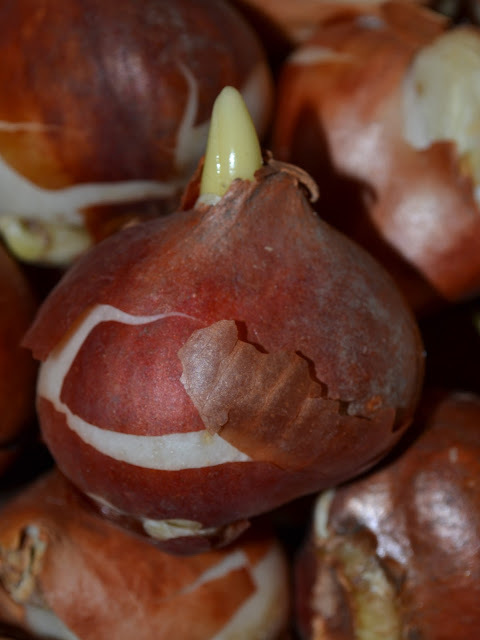 Over the years, I've learned a few things that can help make your bulb planting easier and more successful. By grouping bulbs, you'll make a more dramatic show in your garden—and you can dig one very large hole for many bulbs as opposed to lots of time-consuming individual holes. Who doesn't like to save time and create a better design impact? If you purchased several varieties of bulbs that bloom at different times, such as crocus and tulips, dig a large, deep hole. Plant the tulip bulbs first, as they require additional depth. Partially backfill soil into the hole, then plant a layer of the smaller crocus bulbs. Fill in the remainder of the hole with soil. You'll have a lovely, continuous display of blooms throughout the spring. If you have a choice in sale bulbs, choose varieties that flower in intervals. Tulips, for instance, include early, mid, and late-flowering varieties. Select some from each group for continuous blooms. Good drainage is a must. Otherwise, all of your efforts will simply rot away. The vole is my nemesis. Garden cats tend to help alleviate the problem...unless they turn into spoiled, overfed, lazy fluff balls like our Sammy and Oreo. We love them, but the kids feed them too many treats for them to be inspired to hunt. Voles will devour your tulips and snack on your lilies. Don't bother with vole-repellant products. I've tried all organic remedies, and honestly—the bobcat urine was like adding salad dressing to the hostas. I'm sure the poison bombs probably work—but they're not happening in our gardens. What I have found, though, is that a little extra prep work when planting can help alleviate some of the vole destruction. Apparently, voles don't like to cross anything sharp in the soil. After you've dug your holes for your bulbs, line the bottom and sides of the hole with a layer of sharp gravel or perlite. Place a bit of soil on top, then add your bulbs and cover with soil. I've succeeded in saving bulbs from becoming vole midnight snacks by using the gravel. It's worth the extra effort and small expense. Trust me. After all, you know you're going shopping tomorrow so you can pick up some stunning Star of Persia Allium or Checkered Lily Fritillaria, and maybe some Ice Follies daffodils or a few Lady Jane species tulips. All for 75% off. You know you can grow that! Just wait. Your garden will be bursting with color next spring.